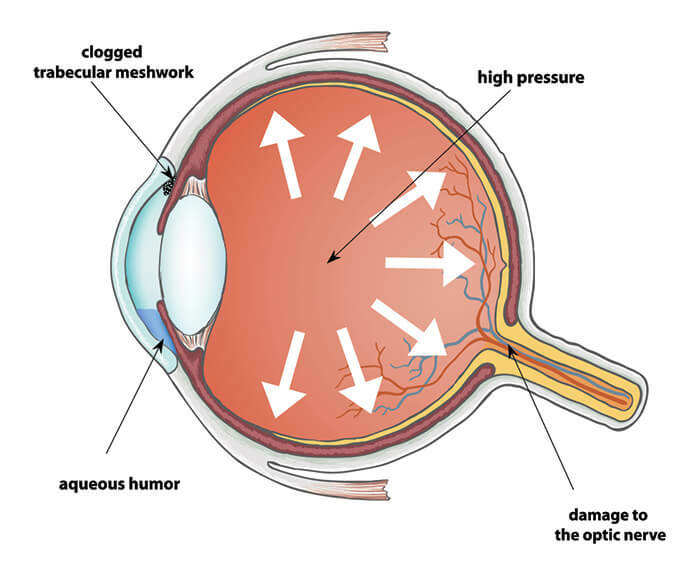 Glaucoma is a vision-threatening disease that can cause optic nerve damage, most often from high pressure caused by poor drainage of fluid (aqueous humor), which supplies nutrients to the cornea and lens. Glaucoma is one of the leading causes of vision loss, and involves progressive and irreversible damage to the optic nerve. Fortunately, glaucoma is highly treatable. The key to preventing serious vision loss or blindness from glaucoma is early detection. An annual, fully dilated eye examination is recommended. Treatment involves medications, laser procedures and/or surgery to lower internal eye pressure by opening drainage passageways for the trapped fluid. In early stages of open-angle glaucoma, medicated eye drops are usually prescribed to lower the eye’s pressure. If the condition worsens, a laser procedure called a trabeculoplasty is performed to lower pressure further. Laser therapy usually takes approximately 10 minutes and has achieved excellent success rates in select patients. The treatment for angle-closure glaucoma, or narrow-angle glaucoma, is generally initiated with laser iridotomy to open the drainage channels of the eye.